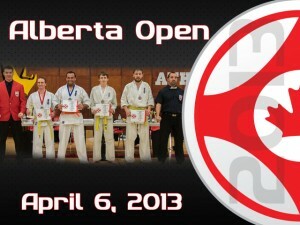 On Saturday April 6th I attended the Alberta Open. This year's event had over 130 competitors. This tournament has grown every year since I first attended in 2005. The tournament started with kata. As the divisions went on I noticed how much improvement there has been in kata generally. From the youngest beginner who's nerves sometimes got the better of them to the most seasoned veteran, all approached their katas with great conviction. Next was non-contact fighting. I always enjoy watching these little ones. They always fight with passion and ferocity. From starting the techniques 6 feet apart gravity seems to grab them and draw them closer until they are within scoring range. For us, as adults walking across that line can be scary, intimidating and nerve wracking. I wonder what goes through these young competitor's minds as they step into the ring. At the end, all showed great spirit and drive but above all things great sportsmanship. Now into the contact portion of the tournament. For me refereeing is my favorite part of tournaments now. As a fighter back in the day I never realized how difficult a job it was to be an official. I have a much greater appreciation of it now and strive to be the best I can be for the fighters. It's also the absolute best seat in the house. The children are always fun to watch and to see them grow from event to event. As a fan and parent I wish all parents could have the chance to watch the fights as close as I get to. As the day went on the fighters wear less and less protective gear and more targets are allowed. The teen boys came out and fought hard with great technique and strong blows. The women's division was the one that stood out for me. The quality of the fighting was second to none on the day. The final between Lindsay (Banff) and Tilly (Calgary) was a clinic in spirit and determination. 2 extensions and the decision had been made. Lindsay won with a 3-2 decision. With the conclusion of a successful event the Edmonton Club hosted a sayonara party where all could come together and socialize and relax. Thanks to the Edmonton Club for sponsoring this event. A great time was had by all. 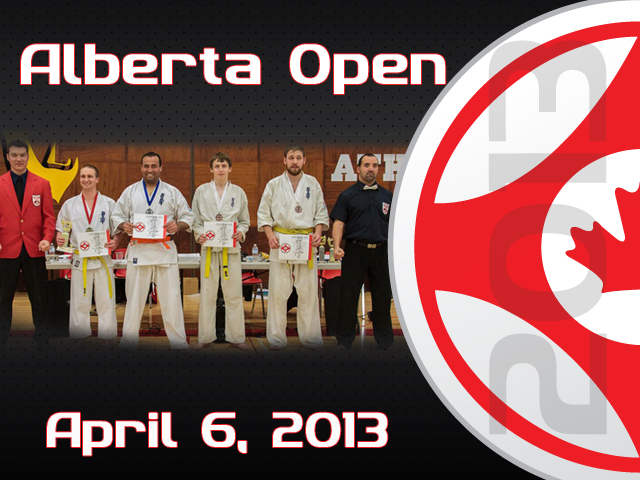 On April 6th 2013, the Edmonton Kyokushin Karate Club once again hosted the Alberta Open Kyokushin Karate championships. This year’s event saw competitors from dojos in Edmonton, Calgary, Stony Plain, Banff, and Dawson Creek make up 150 entries in kata, non-contact and knockdown fighting. The event was a great success, with spectacular fights, beautiful kata, and trademark Kyokushin spirit, effort and sportsmanship. 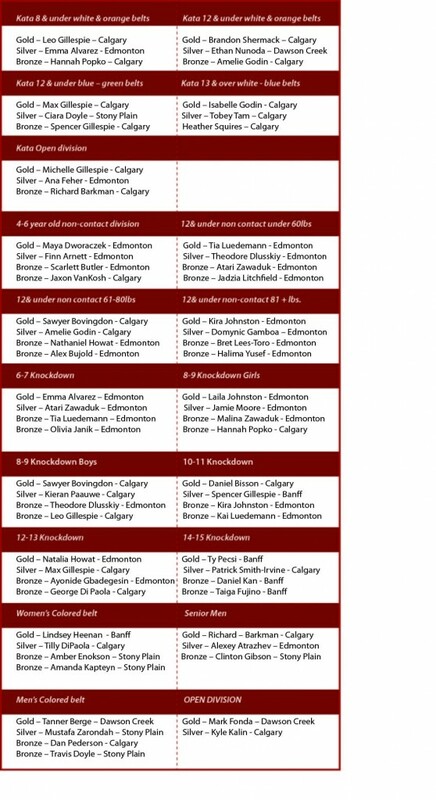 This event gave competitors an opportunity to compete and develop friendships while building on experiences from the recent Calgary Cup and to make final preparations for the upcoming 30th Canadian Championships. The day was filled with fun, ferocity, and no serious injuries. For the second year in a row the men’s open division finished the tournament with an impressive ippon victory. The Edmonton Kyokushin Karate Club would like to thank all the competitors, spectators, officials and volunteers that made this event such a success. We hope to see you all again next year. OSU! The Alberta Open was held this year on April 6th at the historic Strathcona School in Edmonton, Alberta. Over a hundred competitors from Dawson Creek, Stony Plain, Banff, Calgary and Edmonton took part in the days events and brought a tremendous amount of Kyokushin spirit with them. 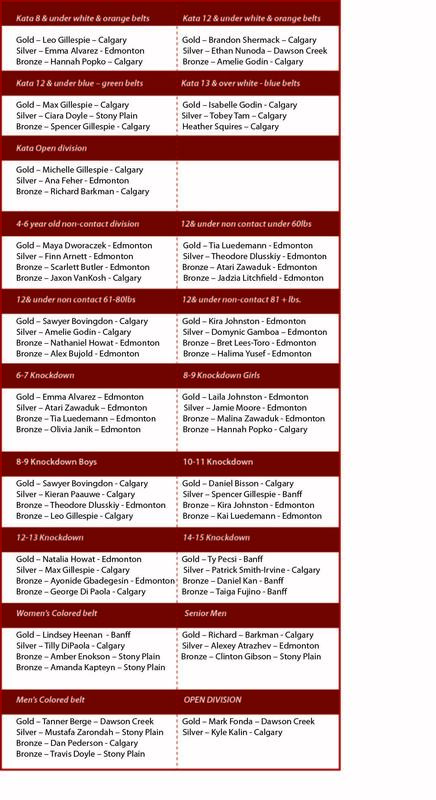 I made the trek north with my family and a large number of Calgary competitors to once again take part in the wondeful tournament, and to prepare for next month's 30th Canadian Championships. The morning started out with the Kata divisions, with the youngest competitors taking to the mat first, helping set the stage for a fun and competitive day. A lot of time and energy goes into training for Kata, as well as a lot of courage for those who step on the mat for the first time in front of a large and cheering crowd, but the nerves quickly dissapeared as one by one the competitors showcased their skills. The crowd in attendance got to see the progression of Kata, starting with our young and novice competitors and culminating with a large Open Division that displayed the most advanced Kata of the competition. I was fortunate enough to be among this group of competitor and truly enjoyed watching my fellow competitors leave it all out on the mat, with true technique and skill being displayed by all. Once the Open competitors finished, the morning medals and trophies were handed out, and a short break took place to allow those competing in the Kumite portion of the event the opportunity to get ready. The afternoon started out with the non-contact divisions, which had some of the largest divisions of the day. The children showed amazing spirit and stamina, with some very close and competative matches that had the crowd excited and left the officials with tough decisions. The fighting spirit continued with the children's knock down, with many fights being decided by last second efforts on the competitors part. The teen and adult divisions followed, and the jump in experience and technique showed as the fighters put on great performances. The highlight fights for me were the Women's final and the Men's Colour Belt final. In the Women's division, Tilly DiPaolo of Calgary and Linsey Heenan Sneesby of Banff put on the fight of the day, going to 2 extentions and showing the truest of Kyoukushin spirit in the process. Neither of them backed down, and both displayed great technique and a warrior's heart in their fight. In the Men's final, Tanner Berge of Dawson Creek and Moustafa Zarandah of Stony Plain met in a David and Goliath style battle, with Tanner using fantastic technique and evasion against Moustafa's pure strength. The back and forth battle had the crowd excited, and again showcased Kyokushin kumite for all in attendance. At the end of the day, medals and trophies were handed out, handshakes and hugs were exchanged, and everyone left with a sense of pride for what was accomplished during the day. Many of us attended a great sayanara party hosted by the Edmonton Dojo afterwards, shared stories and built on friendships. I would like to thank the Edmonton Dojo for all their hard work in putting this tournament together, to Sempai Irek for his hard work and long hours put in organizing it all, to the Senseis and Sempais who worked hard during the day officiating all the matches, to all the competitors who participated in the event, and to all the parents and spectators who came out to support us all. This tournament grows in size and calibre every year, and I was honoured to be apart of it all once again. It's a great tournament for first time competitors, for seasoned fighters, and for those looking to prepare for the Canadian Championships in May. I encourage everyone who hasn't made the trip to Edmonton for the tournament to do so, as I will definitely be back to once again enjoy this great event! OSU! This entry was posted	on Sunday, April 7th, 2013 at 8:09 pm	and is filed under Uncategorized. You can follow any responses to this entry through the RSS 2.0 feed. Both comments and pings are currently closed.